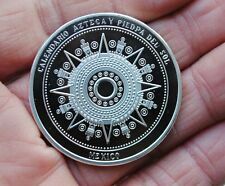 1 piece SOUVENIR MAYAN AZTEC CALENDAR SILVER PLATED COIN. WWII ORDER OF THE PATRIOTIC WAR SOVIET CCCP RUSSIAN SMALL BADGE. Nylon Fabric Canvas Wrist Watch Band Sport Classic Buckle Strap Military 20mm. Material: Silver Plated Iron. Color: Red. Also note that monitor settings may vary from computer to computer and may distort actual colors. Due to the difference between different monitors, the picture may not reflect the actual color of the item. Material: Zinc Alloy. This is for one coin, pictures represent front and back. Main Color: Silver. Due to the difference between different monitors, the picture may not reflect the actual color of the item. Quantity: 1 Pc(coin only,other accessories demo in the picture are not included!). Made of plated alloy,it is high intensity and durable,convenient for vehicle. Color: Silver. In God We Trust design, two sides. Material: Zinc Alloy. This is for one coin, pictures represent front and back. Main Color: Gold Black. Thickness: app.0.2cm/0.08". Very small and easy to carry. Color: As the picture shows, sent at random. Due to the difference between different monitors, the picture may not reflect the actual color of the item. If you have any problems, we are very glad to help you. Then remove it and cleanse the skin. And finally, at last, other drugs can stop. only external use. Material: Zinc Alloy. This is for one coin, pictures represent front and back. Due to the difference between different monitors, the picture may not reflect the actual color of the item. Main Color: Gold. 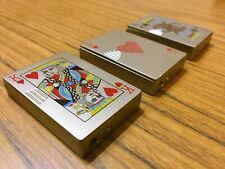 Material: Silver Plated Iron. Also note that monitor settings may vary from computer to computer and may distort actual colors. Color: White. Due to the difference between different monitors, the picture may not reflect the actual color of the item. And finally, at last, other drugs can stop. only external use. Its other ingredients consist of Rhizoma anemarrhenae, Trichosanthin, Arrowroot, Astragalus, Scrophulariaceae, Berberine, Yam & Borneol are well known ancient Chinese traditional herbs used To treat diabetic patients. And finally, at last, other drugs can stop. We do not accept P.O. Boxes. only external use. Donald Trump design,two sides. This is for one coin, pictures represent front and back. Due to the difference between different monitors, the picture may not reflect the actual color of the item. Thickness: app.0.3cm/0.12". And finally, at last, other drugs can stop. Then remove it and cleanse the skin. This is for one coin, pictures represent front and back. Main Color: Gold. Thickness: app.0.3cm/0.12". Then remove it and clean skin. Extracted from Rehmanniae, Rhizoma anemarrhenae,Trichosanthin, arrowroot, astragalus, Scrophulariaceae, berberine, yam, borneol. External use only. For artwork,souvenir,collection,gifts,etc. 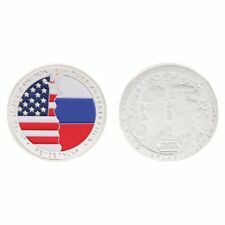 Pattern on the coin is special and funny! Color: Rose gold. Due to the difference between different monitors, the picture may not reflect the actual color of the item. Feature: 100% Brand New and High Quality! Meaningful coins for avid coin collectors Double-sided coin, also called GOOD LUCK COIN, one-side "YES", another "NO", help make decision before difficult choices. Embossed patterns look delicate and touch great Made of quality alloy, sturdy and durable for storage Great for collection,gifts, decision making, etc. This is for one coin, pictures represent front and back. Main Color: Bronze. Due to the difference between different monitors, the picture may not reflect the actual color of the item. Hillary Clinton design, two sides. Material: Zinc Alloy. This is for one coin, pictures represent front and back. Due to the difference between different monitors, the picture may not reflect the actual color of the item. The large horse is approx. 5 1/2" long and 4" tall. US Army Core Values design,two sides. This is for one coin, pictures represent front and back. Main Color: Gold,As the picture shown. Due to the difference between different monitors, the picture may not reflect the actual color of the item. Donald trump design, two sides. This is for one coin, pictures represent front and back. Due to the different monitor and light effect, the actual color of the item might be slightly different from the color showed on the pictures. Color: Silvery. Material: Zinc Alloy. Material: Zinc Alloy. Color: Golden. Maya design is exquisite and precious. Type: Maya. Perfect for arts,crafts,collections,souvenir,gifts,etc. 1 pc of coin only,other accessories demo in the picture are not included! Due to the difference between different monitors, the picture may not reflect the actual color of the item. This is for one coin, pictures represent front and back. Also note that monitor settings may vary from computer to computer and may distort actual colors. If you have any problems, we are very glad to help you. This is for one coin, pictures represent front and back. Main Color: Silver,As the picture shown. Due to the difference between different monitors, the picture may not reflect the actual color of the item. Also note that monitor settings may vary from computer to computer and may distort actual colors. Main Color: Gold,As the picture shown. Due to the difference between different monitors, the picture may not reflect the actual color of the item. Saint George design,two sides. Due to the difference between different monitors, the picture may not reflect the actual color of the item. Also note that monitor settings may vary from computer to computer and may distort actual colors. Main Color: Gold. Due to the difference between different monitors, the picture may not reflect the actual color of the item. This is for one coin, pictures represent front and back. Thickness: app. Honor our real heroes forever, the duty to defend peace. 1950-1953 Korean War design, two sides. Also note that monitor settings may vary from computer to computer and may distort actual colors. If you have any problems, we are very glad to help you. God Bless the United States & 911 Attack design, two sides. This is for one coin, pictures represent front and back. Due to the difference between different monitors, the picture may not reflect the actual color of the item. 1 x Christmas Coin. Christmas design, two sides. Color: Silver. Type: Apollo. Material: Zinc Alloy. Quantity: 1 Pc. Color: As the picture shown. 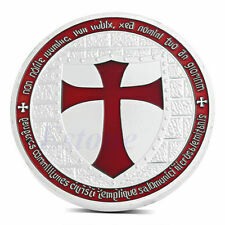 This type of coin is about Augustine Herman,which is a well-known pirate. Type: Augustine Herman. 1 pc of coin only,other accessories demo in the picture are not included! Size: One Size. Color: As pictures shown. Main Color: Silver. Due to the difference between different monitors, the picture may not reflect the actual color of the item. This is for one coin, pictures represent front and back. Material: Zinc Alloy. Due to the difference between different monitors, the picture may not reflect the actual color of the item. Thickness: app.0.3cm/0.12".